This is a highly infectious disease, caused by entry into our air-passages, of “Pfeiffer’s Bacillus Influenza” These germs exist in the nasal and oral discharges of affected persons. The incubation period is short. It is ushered in with cough, cold and sneezing, intense frontal headache, pains and aches in joints, fever (100°—105° F.), a white coated tongue, nausea, prostration and sleeplessness. There is no disease which it does not stimulate, when complications set in. Thus,bronchitis, pneumonia, diarrhoea, dysentery, suppression of or scanty urine, palpitations, disease of valves and muscles of heart, capillary bronchitis, parotitis, nosebleed, diphtheria, coma, convulsions, dropsy and a host of other disease-symptoms may arise as complications. In a word, it is a very terrible disease and should be carefully treated from the very beginning. Prophylactic—Influenzinum 30—200, every other day, during epidemics. Or Baptisia 1x—3x, when the former is not available. Gelsemiun Ө—3x—Sensation of chill, fever, flushed face, eyes watery, headache and heaviness of the head, drownsiness, pain all over the body (especially on the back), chilliness, fatigue. Bryonia 3x—6—Cough, stiff-neck; pain all over the body, relieved by rest; headache; dry lips, patient frequently smacks lips with his tongue, dirty tongue, listlessness; patient remaining quiet in bed, movements cause pain. Arsenic 3x—6— (A very valuable medicine according to Dr. Hughes). Profuse running from throat, nose, and eyes; discharged mucus is hot, liquid and irritating; fever is remittent or intermittent; great prostration; voice hoarse, sneezing; tremors; hot, dry, rough skin; restlessness; thirst; burning sensation all over the body and yet the patient wants to be covered up; anxiety; fear of impending death; sticky phlegm; harrassing cough; cold sweat. Baptisia 1x—6—Vacant look; pain in eye balls; headache; tongue dry and coated; sore-throat; liquid, brownish foetid stools; pain all over the body; restlessness (even if there be no fever); dozing; fatigue; foetid breath; delirium; patient sometimes feels his body as if divided into parts and tosses about in bed to join them. Natrum Sulph. 12x— (trit.)-Dr. Boericke and Anshutz speak exclusively in favour of this as the chief remedy of influenza, especially when the disease has been brought on by cold and damp. 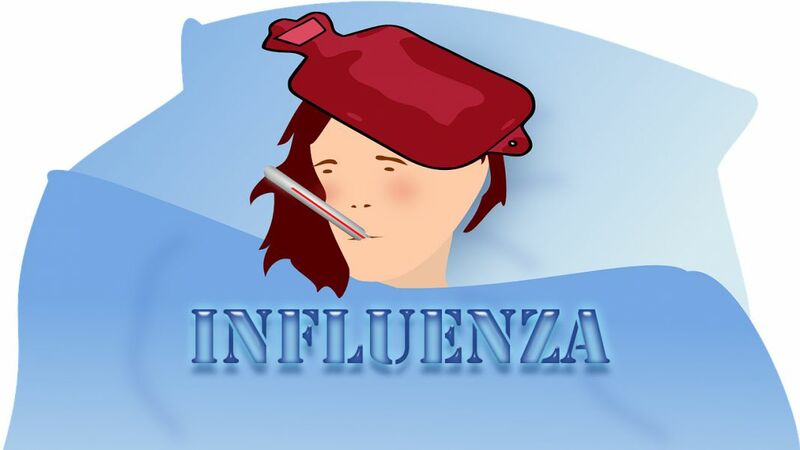 Ordinarily speaking, simple influenza is cured by a dose or two of Influenznum 30. In the early stages, if fever is high and there are thirst, restlessness, dry skin, anxiety, give Aconite 3x. If there is much pain in the bones as in Dengue, give Eupatorium Perf. 1x—3x. In severe backache, give Variolinum 6—30. In nausea and vomiting, Ipecac 3x. In rheumatic-like pains, in loinache, or in delirium with typhoid like symptoms. Rhus Tox. 3—30. In wheezing sounds during breathing, harrassing cough, much mucous discharge; rattling noise in throat; pain in loins, head and back, Antim. Tart 6. In laryngitis of pneumonia, with threads of sticky yellow or white phlegm, brought up with difficulty and much cough; sputum is frothy, bloody or purulent, Phosphorus 6. In incessant cough, Hydrocyanic acid 3. In inflammation of kidneys, Eucalyptus 1x. In heart affections, Iberis 1x. In severe headache, Melilotus 2x. Accessory Treatment—Keep patient in bed, in dry, warm and well ventilated room. He is to keep his head pool. Diet—Diet must be liquids. Acid fruits are strictly prohibited. Abstain from tea and tobacco. Prolonged rest, plenty of fresh air and fresh fruits, liquid, easily assimilable nourishing diet are essential to recovery. All nasal and oral discharges should be thrown into a vessel full of lime and these should be burried or subsequently burnt.